Dermaray UV for the treatment of psoriasis and vitiligo. Hand held medical treatment for chronic skin conditions such as psoriasis, vitiligo, dermatitis, acne and alopecia areata (auto-immune hair loss.) The safest, most powerful and technically advanced hand held UV phototherapy available. Dermaray UV is unlike any other hand held UV phototherapy lamp available. No other UV treatment wand comes close to the power, performance and reliability of Dermaray. "Ultraviolet B phototherapy administered at home is equally safe and equally effective, both clinically and for quality of life, as ultraviolet B phototherapy administered in an outpatient setting. Furthermore, ultraviolet B phototherapy at home resulted in a lower burden of treatment and led to greater patients' satisfaction" BMJ Medical Publications. Dermaray UV is the easiest, smartest, safest, most convenient and effective system available. It can be used in Manual Mode exactly like an old style UVB wand and simply turned on or off but with the added benefits of battery operation, universal power supply and many unique safety features or in Advanced Mode under the watchful eye of our smart computer controlled system. Dermaray UV is so easy to use, in most cases, a manual is not even required. A printed user guide is available optionally and free of charge if required. Dermaray takes the guess work out of home phototherapy and offers a level of safety and automation unique to Dermaray. Innovative configuration wizard prompts user for skin condition to treat, skin type and areas requiring treatment and then calculates suggested exposure times accordingly, no more calculators, pens and complex manual record keeping. No prescription or doctor's letter required to purchase - delivered worldwide by express courier. Dermaray UV is constructed from the highest quality and strongest UV stabilised composite plastic available. Dermaray UV is the safest, easiest to use, most intelligent and more effective UVB phototherapy wand. Dermaray UV is fitted standard with a genuine Philips Medical NB-UVB311, Fluorescent Bulb. Narrow Band UVB lamp, with optional UVA or Wide Band UVB available. Phototherapy is described here. On-board LCD display, real time clock and data logging, with real programmable features. Dermaray UV is supplied standard with a universal 110-260v, 50~60Hz switching power transformer that can be used anywhere in the world by changing the external connection cable to suit your location. Dermaray contains 512kb memory capacity for storing individual 10 patient programs each with up to 32 treatment areas, statistics and session information. Dermaray UV contains powerful microprocessor controlled and digitally temperature monitored to ensure peak performance and reliability. Dermaray UV is an intelligent system based on powerful NXP/Philips, 32bit microprocessor and a flash software upgradable design. System intelligently manages frequency and duration of each treatment and exposure significantly improving patient safety and dramatically reducing the possibility of over exposure. Electronically starts Philips medical fluorescent medical lamp (without the need of a starter, or the internal starter supplied by Philips) increasing lamp life span and allowing effective management of UV emission for more consistent energy output - resulting in more effective treatment and cheaper running costs as medical UV bulbs last longer. Bulb operating life and power output is maintained by running the UV bulb at a higher frequency of 27Khz, other corded systems run at a lower frequency of 50~60Khz. Intelligent on-board battery charger properly conditions the Ni-MH battery and also prevents against over-charging and damage of batteries, significantly extends battery life. In fact, we are using the very latest Eneloop Ni-Mh batteries that have a greatly increased shelf life and significantly reduced self discharge rate for maximum battery performance, as well as being environmentally recyclable. Most other battery systems are based on older less reliable NiCad batteries and have no battery over charge protection that results in reduced battery capacity and diminished battery life. Electronic recording of total exposures and previous session times with auxiliary battery backup. On-board speaker warns against potential problems, on-board system diagnostics and configuration parameters. Electronic temperature monitoring ensures trouble free operation. To help protect our environment recycled cardboard packaging has been used where possible, and RoHS compliant lead free manufacturing processes have been followed to reduce hazardous materials. Each Dermaray-UV undergoes extremely rigorous post production testing, battery charge and discharge testing, operational, extreme climatic and environmental testing to ensure years of trouble free operation and the highest manufacturing quality. Designed, constructed and tested in Australia under ISO international quality control standards. We do NOT produce misleading comparison charts between Dermaray and other products, as there simply is no comparison. Packaging includes Dermaray UV, a universal in-line approved power supply and two pairs of safety goggles, large and small design. To help save our rain forests, a printed user guide is not included as standard, instead please download the latest Dermaray UV user guide. Optional medical practitioner kit includes PC Connectivity Cable and software to program a "prescription" once the allocated program is completed the unit will deactivate until another prescription is entered by the medical practitioner. Optional distributor kit includes a PC Connectivity Cable, software and license to rebrand start-up display and logo etc. Dermaray UV has Australian TGA Class 1 listed, CE mark, FCC mark and Australian C-TICK marks. Dermaray UV can safely be used with our Skin Treatment Pack. Due to the unique method Dermaray UV uses to manage the Philips medical bulbs, there is little loss of power and a generally higher output over much longer sustained usage. This means one bulb will outlast 3~4 bulbs in other UV lamps, while providing consistently better and more effective therapy by maintaining a higher power output for the duration of the bulb's usable life. The Dermaray UV's unique design maintains in excess of 82% power output after 1500+ hours. A typical mains powered UV device continually loses power with each use and has a 1/2 life of approximately 300 hours. Dermaray UV has significantly lower running costs, more powerful and consistent energy output that results in more effective therapy. The demonstration videos below provide an overview of the setup and general operation and features of the Dermaray UV phototherapy lamp. 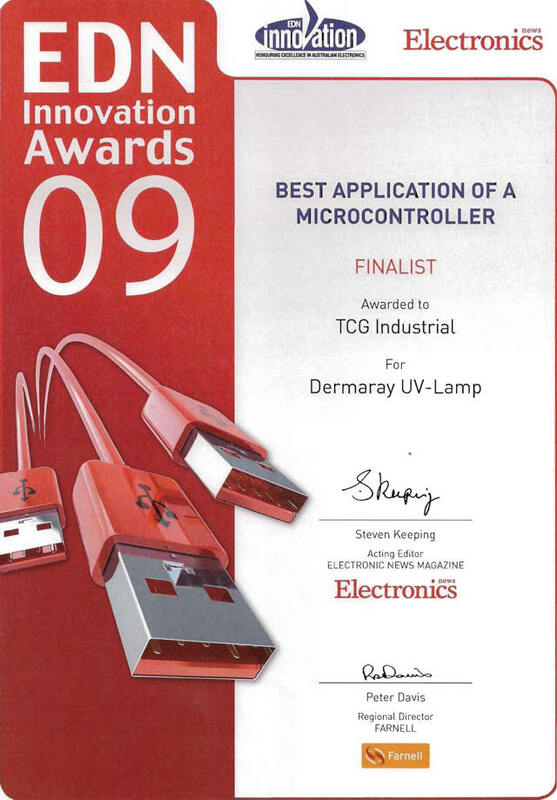 Dermaray UV finalist in the EDN Innovation Awards 2009. TCG Industrial was a finalist at the prestigious EDN Innovation Awards for 2009 in the "Best Application of a Microcontroller." This acknowledges the innovation and unique features found in Dermaray UV have attracted wide spread recognition from major industry experts. Who or what is Dermaray? How are Dermaray products more powerful and also safer to use? Where are your before and after pictures, testimonials and product comparisons? Do you post on internet chat rooms and internet web forums? I have seen posts on internet web forums that say it costs $5 to build a laser comb! I have seen another laser comb cheaper online, will you match the price? Aren't high powered lasers potentially dangerous? I have an idea how to improve your product, want to hear it? How do I know Dermaray will work for me? What about the cost, I have seen cheaper laser combs. How strong does a laser need to be?